Irish Rail is protecting the rail line along Greystones South beach for about 300M with steel piling and rock armour. This work will take till Christmas together with more protection further South towards Kilcoole. 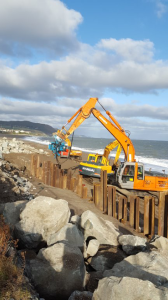 ‘I am pleased that this is being done as erosion had washed away the South part of the beach while building up the North part so it is much wider than in the past’.